Change the way you scoot with the Sporter 2 Pink Scooter! Travel and play with no pushing, no pedals and no limits! The rider just moves from side to side and they’re off! The innovative engineering of this three-wheeled scooter will totally revolutionise how kids play and scoot. With two boards instead of one, this scooter is designed to be more stable as well as offering kids a whole new way to move. The anti-slip footplates on the decks provide kids with good grip and a more secure ride. The pink footplates, wheel trims, handgrips and brake cable add bright bursts of colour to the black frame. 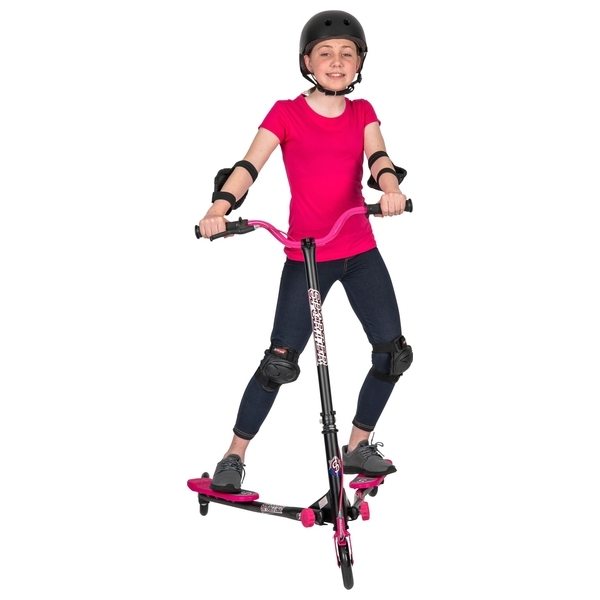 The Sporter 2 Pink Scooter features padded handgrips for the comfort of the rider. The long lasting super-casted 145mm polyurethane wheels make sure that your kid has a smooth ride. The sturdy steel frame is strong and durable and the hand operated front calliper brake provides children with an important safety mechanism for greater protection. The Sporter 2 Pink Scooter folds quickly forasy storage. Just unscrew the bolts near the front wheel to collapse the scooter into a compact fold. The safety gear and helmet are sold separately. The maximum user weight for the Sporter 2 Pink Scooter is 100kg.